SAMARA, Russia – The project team of RTV-RTC has carried out the installation of a new OB van for Russian broadcaster, VGTRK at its Samara base, featuring a HARMAN Studer Vista 1 all-in-one console. The 12-camera van was commissioned in September this year with the audio and intercom design masterminded by RTV-RTC’s Alexander Yankovsky. The Studer system comprises a 32-fader desk with optical MADI card and Studer Compact Stagebox, with 32 mic/line inputs and 16 line outputs. An Si Compact 16 with optical MADI card, from HARMAN Professional sister company Soundcraft, has been supplied as a backup audio mixer. RTV-RTC won the tender for the design and construction of the mobile television studio for VGTRK back at the end of 2012. This 10+2 HD camera truck has been designed for all types of OB filming and recording of social and political events, concerts and performance as well as shooting sporting events throughout the Middle Volga region. “We recommended Vista1 to our customer based on the excellent quality of the sound and the inbuilt sound processing,” stated Yankovsky. 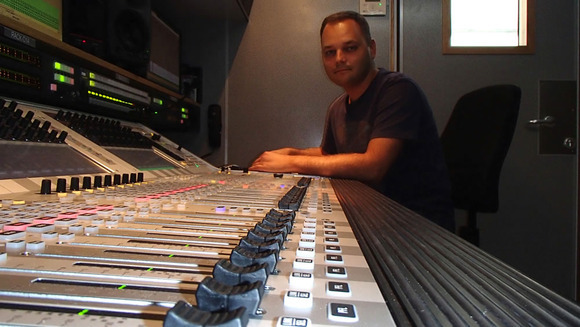 “It offers one of the best price/function ratios — and this was a very important aspect, as it allowed us to put into practice the customer’s requirement, namely, flexible and cost-effective sound for video production possibilities. The new OB van will produce two independent television programmes, including live broadcast and is designed to work in HDTV format, with the ability to switch to HD / SD. It has been designed on a two-axle trailer chassis with a total body length of 12.3 metres, with dedicated rooms for audio, video, engineering and computer room / rack room. There are also two external commentator positions with two-way signal delivery via Telecast T-POV receiving and transmission sets. As for audio, the main Vista 1 has been integrated into the MADI router through two optical MADI connections, which provide all the necessary sources. The mixing console, with the Vistonics™ user interface and 40 on-screen rotary knobs, has built-in signal processing, 32 -fader direct access and signal level meters on each channel. In fact everything is contained within the console — the control surface, I/O system, DSP and power supplies are all in one box making it ideal for restricted space environments such as in OB and ENG vans — or for applications where the console needs to be moved with ease. The back-up Si Compact 16 allows a basic mix of 24 channels. Other key people involved in the build were chief project (and video) engineer Evgeny Zaytsev and project engineer (power distribution), Georgy Kozhevnikov.